The profile picture you display to the world online, usually via social networking sites, can say a great deal about you. People can and will make instant judgments based on the image you have chosen to represent you in this world we refer to as “virtual”. This makes the decision process behind choosing your profile picture a more important one than you may think, as can be seen in this infographic How Your Profile Pic Is Damaging Your Online Personal Brand [INFOGRAPHIC] How Your Profile Pic Is Damaging Your Online Personal Brand [INFOGRAPHIC] These days, we are identified and judged more and more by how we appear to others on social networking sites. Sites like Facebook and Twitter allow us to brand ourselves in any image we choose... Read More . This led to us seeking to discover how and why you choose these pictures. Was it a conscious decision to put that photo of you drunk and grinning inanely on Facebook? Does that anime The Best Anime Sites On The Web The Best Anime Sites On The Web Read More character truly represent you and your values? How & Why Do You Choose Your Social Networking Profile Picture? We asked you, How & Why Do You Choose Your Social Networking Profile Picture? The response was fair, with a good number of you deciding to share your thoughts on the subject with the MakeUseOf readership. Responses varied from those who don’t place any importance on their social networking profile picture and consequently don’t update it, to those who have chosen carefully in order to foster a professional appearance. Some even suggested that while they know changing their picture often and to random images could look bad, they do it regardless. I myself reside in that category. It depends on what social network I use. I have a Facebook, Twitter, Tumblr, Google+, Pinterest, Instagram, and probably some others that I’m forgetting. Facebook changes often, simply because I try to have my profile picture and cover photo reflect the changes in my life. My Twitter hasn’t changed simply because I’m lazy. I also tweet pictures a lot, so those are how my followers track my life changes, etc. For Tumblr, I used a random photo I had when I set it up, and I haven’t changed it at all. Google+ changes with my email contact information. Pinterest was another random photo, and Instagram changes with the pictures I post to the app itself. I feel like girls change things up a lot more than guys would. As a sophomore in high school, I feel like many teens are focusing on making friends on social networking sites and not on real, social graces in real life. In fact, one girl I met thru acquaintances accepts every single Facebook friend request she gets no matter who it is from. She does the same thing for her Twitter. I use social networks to meet new people (Twitter, Tumblr, Google+), stay in contact with friends (Facebook, Twitter, Instagram), and share my personal interests (Tumblr, Instagram, Pinterest). Needless to say, I change my profile picture depending on what network I’m on and how I feel. This was not only the most-definitive response to the question but also one which threw up several interesting points. Not all social networks are created equal, so we tend to change profile pictures on some more quickly and more often than on others. Also, it differs across the age and gender spectrum, with (my assumption being) high-school girls are more likely than most to change their pictures on a whim. ‘Chris’ also deserves a mention for recounting how he ditched social networks altogether and explaining what a positive effect doing so had on his life. We’ll be asking a new question tomorrow, so please join us then. 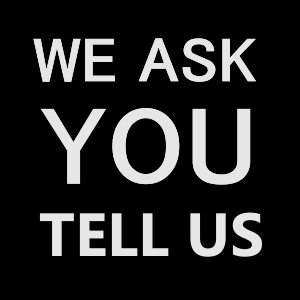 ‘We Ask [You] Tell Us’ is a weekly column dedicated to finding out the opinions of MakeUseOf readers. We ask you a question and you tell us what you think. The question is open-ended and is usually open to debate. Some questions will be purely opinion-based, while others will see you sharing tips and advice, or advocating tools and apps for your fellow MakeUseOf Readers. This column is nothing without you, as MakeUseOf is nothing without you.